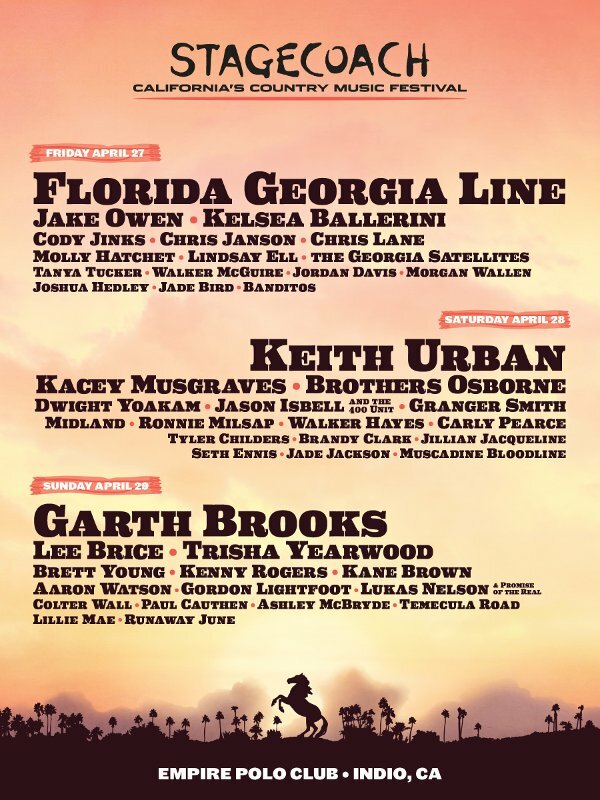 The Stagecoach Festival, the country version of Coachella held every year on the same site in Indio, CA, has announced a powerhouse lineup for their 2018 show. Scheduled for April 27 through 29 at the Empire Polo Club, the festival will see two veteran singers and a modern duo as headliners with Florida Georgia Line on Friday night, Keith Urban on Saturday and Garth Brooks on Sunday. Other veteran artists on the list include Molly Hatchet, the Georgia Satellites, Tanya Tucker, Dwight Yoakam, Ronnie Milsap, Trisha Yearwood, Kenny Rogers and Gordon Lightfoot. Passes go on sale on Friday, September 22 at 11 AM PDT for $329 to $1,199. Single tickets, if available, will be sold at a later date. Additional artists are expected to be announce at a later date.